This part of Southern Alberta has some beautiful scenery as the magnificent mountain range of the Rockies seems to magically appear and rise up above the landscape. 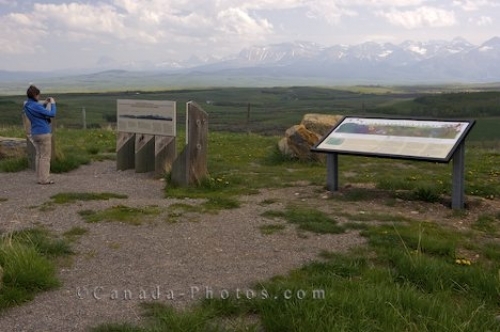 The prairie countryside of wetlands, lakes, rivers and alpine forests extends for miles and many tourists stop at this viewpoint to read the signs explaining the region of "Where the Mountains Meet the Prairies". Tourist (model released) photographing the sign at the viewpoint of "Where the Mountains Meet the Prairies" looking towards the Waterton Lakes National Park along Highway 6, Southern Alberta, Alberta, Canada. Picture of a woman taking a picture of the signs of "Where the Mountains Meet the Prairies" in Southern Alberta, Canada.